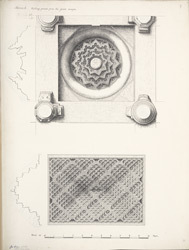 Illustration of a ceiling panel from the Jami Masjid at Broach in Gujarat from James Burgess' 'Original Drawings [of] Muhammadan Architecture in Gujarat.' Broach [Bharuch] is one of the oldest ports in western India; it was an important trading centre from the 1st century. Burgess wrote, "the roof [of the mosque] is supported by forty-eight pillars, in two rows of twelve each in front and one at the back, with two broken rows of six each supporting the sides of three domes - the central one about 30 feet in diameter and the side ones about 23 feet each. There are also seven small domes, of about 8 feet diameter each, over the alternate spaces in the front aisle, and the same in the back one... The backs of the mihrabs and the windows break the wall at the mosque level."